DJ Posse Mobile Music - About Your DJ! Bob is the owner and primary D.J./Emcee for DJ Posse Mobile Music. While growing up in California, he showed a unique interest in music performance and sound systems. 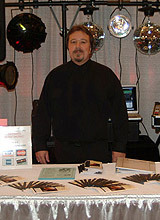 He moved to Reno following high school and attended the University of Nevada, Reno on a music scholarship. He graduated with a Bachelor of Arts in Music and was immediately hired onto a teaching fellowship at UNR. During that time, he was responsible for several successful music ensembles and was able to pursue his additional interest in recording techniques and sound reinforcement. Following his college experience, Bob felt well-trained and experienced in the skills needed to pursue his career in music performance and education. Beginning with his college years, he has been a performing musician (trumpet) for a variety of groups. He has performed and Emcee'd at weddings and other special events since the mid 1970s, giving him over 30 years experience in the entertainment business. He has been a successful conductor of 25 musical theatre productions for the Nevada Reperatory Company, has written numerous musical arrangements for a variety performers including the Joe Rossi Orchestra and vocalist Cami Thompson, and has been a past conductor and arranger for the "Miss Nevada Pageant." In addition to these accomplishments, Bob has been employed as a teacher with the Washoe County School District for the past 29 years. In 1999, he futher pursued his interest in computers by completing a Masters Degree in Information Technology. It eventually became apparent to Bob that he could merge all of his experiences, interests, and skills into one area. Seeing it as a logical step, he opened DJ Posse Mobile Music. Within this focus, he is able to successfully apply his musical background, technology skills, and experienced public-speaking abilities to provide a high-quality, professional experience. Bob is capable, quick-thinking, observant, responsible, imaginative, and talented. He doesn't have to hear himself talk to feel important. With Bob at the helm, you WON'T get a mouthy D.J. with bad jokes and bad timing. What you WILL get is an efficient, personable Emcee who knows what to do and when to do it. You can be assured that your event will be well-timed and well-hosted.